Get ready for a day of fun in Puerto Vallarta! This giant catamaran can take groups of up to 100 people to some of the most popular destinations in Puerto Vallarta, such as Quimixto, Las Animas and Los Arcos. The fun-loving crew will keep you entertained all day, with dancing, games, music, and of course an all-you-can-drink open bar. The itinerary is up to you of course, and we can party as much or as little as you want for your group. If you prefer a quiet and relaxing cruise on the bay that is no problem either. Snorkeling gear is included on the trip, so if you want to stop at Los Arcos Marine Park for snorkeling, we can do that, or if you prefer to head straight for the famous waterfall at Quimixto or one of Puerto Vallarta's best beaches, we can do that too. Watch for whales along the way (in season), and take panoramic photos of the Puerto Vallarta skyline, all in shaded comfort. If you prefer the sun, that is no problem, there is plenty of room for that too. 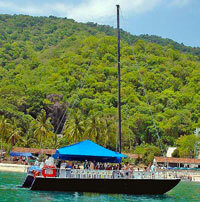 Departs From: The Main Marina in Puerto Vallarta. Exact Meeting Instructions will Accompany Your Confirmation.